Circular horizontal dial 20 in. diameter cast in bronze. Has Roman numerals at hours and 15 minute marks. Gnomon missing from dial, but kept by groundskeeper, as it will not stay in place. Was temporarily re-installed for the NASS tour in 1995. The dial is modern, honoring George Donald Meid for service to the National Academy. Dial is mounted atop a concrerte cylindrical post. Large, ground level horizontal dial 16 ft. in diameter with 49 in high stepped hollow painted-green metal gnomon that is 5 ft 16 in long. Roman hour numerals with hour lines from 4:30 AM to 9:30 PM. Gnomon structure recalls the much larger Indian observatory dials. An appropriate poetic passage, once bolted to the gnomon, has disappeared. Vertical bronze dial with Arabic numerals and long cast sunburst gnomon. On oblong sandstone. Dial is 60-80 feet up on an octagonal power plant smokestack. It is difficult to read, but safe from vandalism. School dated 1928. Similar to Eastern High School (#202). Sandstone Vertical declining dial, with gnomon offset to account for it. Above doors to rear terrace of admissions building. Arabic hour numerals with half hour lines. Carved hourglasses on both sides frame the dial. Brass compass rose set into the brick terrace below suggests the general alignment of both house and dial. 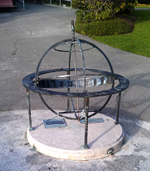 Very nicely armillary sphere about 3 ft. diameter, with equatorial, meridional and hour circles. Roman hour numerals from 5 AM to 7 PM. One of Washington DC's cleanest examples of a working armillary sphere. Erected by the Georgetown Garden Club in 1956 in tribute to Sarah Louisa Rittenhouse. Dial is placed atop a sandstone pillar. Horizontal dial about 16 inch square made of bronze. Gnomon is 4.125 inch high, 5 inch long. Below gnomon is motto, "Horas non numero nisi serenas" (I only count sunny hours). House was built in 1805 and is now open to the public as a museum. Years before this property was opened to the public, a family member brought this dial from Crossbasket Castle in Scotland, the family seat. The lengthy inscription is probably a later addition, since it is unlikely that they would be quoting Whittier in Scotland. The gnomon angle is 39? 30', probably made for the Washington DC location. However, the dial plate has a latitude of about 48? N, certainly not Scotland. What is the true origin of this dial? In the Bishop's garden is a weathered 13th C. capital on which sits a 41 cm diameter horizontal brass dial. It is engraved with "Tho Heath, London" and the year 1712. On the noon line is the indication "Hammersmith", a location on the (then) outskirts of London at 51:30N 0:14W. Heath is one of the Grocers' Company mathematical instrument makers Many of Heath's dials have a coat of arms. Vertical dial with bronze Roman numerals and trefoil pierced gnomon on square sandstone. Dial is on south facade over main entry, facing East Capitol Street. School is dated 1923. Elevation above entrance is approximately 30 ft. making dial hard to read. Large projecting towers place dial in shadow in early morning and late afternoon. Similar to McKinley High School dial (#207).